“In many cases, it’s not a water shortage problem, it’s a water allocation problem” -Stephen Carr. This quote really resonates with rainwater harvesting, water recycling, and Permaculture practices. There is not a shortage of this natural resource in most areas, more of a shortage of collection, gathering and using the natural resource to the most of our advantage. 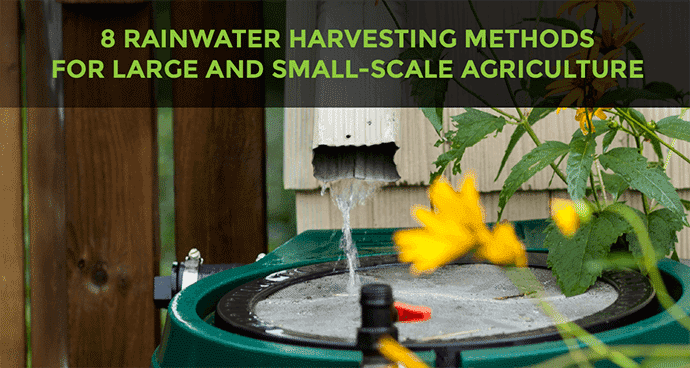 I want to share eight methods of rainwater harvesting and water conservation practices that I have learned and practiced throughout my farming and permaculture background. Rainwater Harvesting is the collection of rainwater runoff from a structure or other impervious surface in order to store it for later use. This checklist is a brief description of each method. I will follow up with full blog posts on each method in the future. I do want to express a few disclaimers: First please be sure to check with your local laws and regulations regarding rainwater collection specific to your area. Second before drinking or consuming any collected water be sure to test the water and put a purifying process in place. Water surrounds the world! 71% of the world’s surface is covered in water. The oceans around the globe are over 96% of the world’s water. Freshwater is also available in our rivers, water vapor, lakes, ice caps, glaciers, and aquifers. 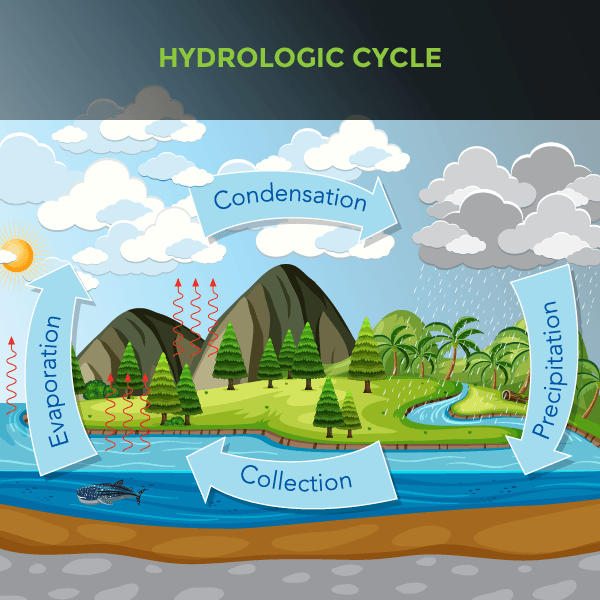 Earth’s water is always moving within the hydrologic cycle. Water is always in continuous movement changing forms between solid, liquid, and vapor. With that being said it’s important to understand where the water flows through your land and how to design your land with permaculture to avoid soil degradation, drought, erosion, and flooding. One way to control the flow of the water is to use swales. A swale is a trench used in permaculture to irrigate farmland, mitigating stormwater runoff, reduce erosion, and improve soil quality. Swales changes the pattern of the water from overland flow to an underground flow. Changing the flow, reducing and redirecting the water to where you need the rainwater. Barrel System comes in two forms complex and simple. The simple rainwater barrel system using gravity by collecting rainwater from your roof into barrels. This would be your first step to making your home, your garden, your farm more sustainable if you haven’t done so yet. A landscape technique used in Permaculture to maximize the natural resource of rainwater on your land is Keyline Design. Which designates a topographic feature related to the natural flow pattern of water that flows through your land. Key Line Design uses the form and shape of the land to determine the layout and position of farm dams, irrigation areas, roads, fences, farm buildings and tree lines. While using the natural pattern and ecology this method will restore and increase the quality and fertility of the soil. “Vallerani System” (VS) is a new approach to technical and socio-economic integrated management of human and natural resources. It consists of a method of working arid and semi-arid land to bring life back and restore the degraded soil. Dr. Robert Dixon has been experimenting and having great success with a simple way to fast-track the revegetation of barren lands since 1976 — with a technique called ‘Imprinting’. This method uses the “Edge Effect” by “Imprinting” patterns to the soil. This method is the answer to the Permaculture Nay-Sayers that rebuttal with how long permaculture takes to see results. Trinchera’s are gathered rock check dams to restore drylands and rainwater harvesting. Gabion method is a larger scale of Trinchera. Gabions are rock-filled baskets formed by a mesh of galvanized wire dam structures. These dam structures are innovative concepts of dryland restoration and rainwater harvesting. A design system that uses man-made lakes, swales, and terraces to fight against erosion, desertification, and climate change stricken areas. A really good friend of mine John D. Liu filmed a legendary documentary on water retention landscapes. Every year World Permaculture Association does a Permaculture Design Course where we spend a lot of time and effort in educating on creating water harvesting systems. We have teachers that have extensive global experience in different climates. Next year’s Permaculture Design Course will be February 15th-24th 2019 and will be in Italy. We will post more information as the event gets closer. Those are some of the rainwater harvesting methods and tools used in Permaculture. I am really passionate about rainwater harvesting because it’s the solution to so many issues we are currently experiencing on Earth. Stay Tuned with us. . .
Each Monday I will release a Featured Blog Post on each of these methods!